Instead of flying back to Karachi from Lahore, I decided to take a train and experience firsthand the conditions of the passengers traveling by second class. I got a seat in bogey number three in Super Express and the train hissed out of the platform, amidst thunderous showers. Its pace was slow, slower than any other express train. The compartment was jam-packed with passengers. Those who had reserved seats occupied their seats, while a bunch of others were perched on the floor, near the seats or even by the toilets, with the result that it became difficult to move from one place to another, or even go to toilet. Families having little children spread quilts and pillows on the seats, under the seats or by the seats. Soon it was a mess all around. A child threw out near a seat, another answered nature’s call. The compartment became filthy, smelly and dusty within hours – a place totally unfit for humans. A ticket checker entered the bogey and started checking tickets. He approached the passenger on seat 54, a tall, sturdy middle-aged man with sharp gray eyes and what looked like an unnatural expression on his face. When asked for the ticket, he showed his unreserved ticket, and so he was asked to vacate the seat. After an argument, he took the ticket checker aside and returned after a few minutes to occupy the same seat, which now was officially given to him. The ticket checker overlooked the mess everywhere in the bogey, smiled and went out at the next station. If it were not for the rains in Punjab, the heat and dust would have been unbearable. The man on seat 54 looked about and saw a young woman with a little child on her lap by a window seat. Somehow his gaze froze. The woman’s eye fell on the man’s face, and she immediately looked down and adjusted her dupatta (scarf) on her head. I am sure she was wondering why he looked at her unabated. The night progressed and people tried to get some sleep. Seats were so uncomfortable that only a very heavy sleeper could manage to get sleep. The wooden planks on the seat and at the back actually hurt. I was at a loss to understand why a round wooden structure was placed in the middle of the back of all seats. It didn’t give any comfort; on the contrary it added to the discomfort. The train, having stopped at a number of stations, continued its slow pace .Because of the heat and suffocation in the compartment, some of the windows were kept open. The woman with the child on her lap looked at the man on seat 54. He was still staring at her. I was beginning to get angry with him. He seemed to be a pervert. Even under such filthy and uncomfortable atmosphere he couldn’t resist to appease his desire of looking at an attractive woman and fulfilling his lust. How low can a man stoop? Such persons are not fit to live. Of what good are they? Could they bring any goodness in anyone’s life? Such thoughts, I am sure, must have also entered the woman’s mind, for she now looked at him with fire in her eyes. Turning her face away, she played with the child for a moment. The train was approaching a station. I could see the familiar lights of Khanewal station. The train stopped and a flash of past memory passed through my mind. 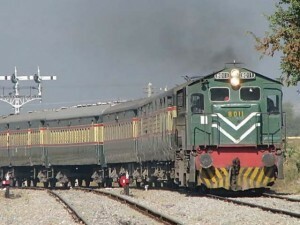 Before we migrated to USA, my family and I used to travel frequently by train, and whenever the train stopped at Khanewal, my little daughter urged me to get down and buy some earthenware or ceramic toys from a stall. In the middle of the night, I used to get down with her, buy the toys and enjoy a cup of tea in a clay cup at a tea stall. It was now 2.00 a.m. and I got down from the train to recapture the figment of the pleasant memory after two decades. I ordered a tea and was enjoying it, when two burly, tall men came near me and stood on my sides. I could feel something probing at my right side. “Take out your wallet and give it to me,” ordered one of them. I took it out and handed the same to him. The other man relieved me of my wristwatch. “Have a safe journey,” said one of the men. Both disappeared. I was stunned for a moment, then a bitter smile came over my face, as I realized that one should never try to recapture the memorable scenes of the past, for if you did that, you are likely to lose that memory – forever. The present is world apart from the past! Let the good memories of the past remain only in your mind. I was shaken, not because I lost my wallet and a watch, but because I lost a cherished memory! Though I am not very wise, but it was wise of me to keep only a few hundred rupees in my wallet, the rest of the money in dollars, my credit cards and other ID’s were safely tucked inside my shoes. The watch was a cheap one, bought for four dollars from Kmart in Chicago. I finished the cup of tea and returned to my seat in the train, not daring to take out some money from my shoes and buy the toys. What use these toys would be to my daughter who is now in her twenties and mother of two sons? The train started. The man on seat 54 was still looking at the woman. The child was still awake in his mother’s lap. The woman found it difficult to keep her eyes open. She was soon lost in a momentary wink of sleep and her head fell forward. A moment later, the child ascended the open window. One leg went out…. . The man on seat 54 leaped like a leopard, caught the child before it fell out of the window. The commotion woke up the woman. She seemed to be in a panic, and then reality dawned. “Here, hold it,” said the man. “You should be very careful holding a child near an open window in a train. For a long time your child was looking for an opportunity to leap out of the window. That’s why I have been watching the child continuously.” Saying so, the man gave the child back to the woman, stretched his back and moved away. The woman looked dumbfounded, and so was I. The man actually saved the life of the child! It came to me like a shock that one never can know or read the intentions of another person. The man who looked like a devil was in fact a saint! The woman gulped a few sips of water, got up to thank the man, but he was not in sight. The train moved on. Early in the morning, at Drigh Road station, the woman got up to get off the train. She searched for the man, but couldn’t find him. “Bhai (brother),” she addressed me, “If you see that man, will you kindly thank him on my behalf?” I nodded. Before I got down at Karachi Cantt, I looked for him in the whole compartment, but couldn’t find him. Rafiq Ebrahim is a freelance writer, contributing regularly to various magazines in Pakistan and USA. He has also written three novels; the latest – BEYOND THE CRUMBLING HEIGHTS(Colors in the life of a slum boy) was published in USA in 2009 and is available at amazon.com, barnesandnoble.com and google.com/books.